The higher seed (in parentheses) had the home field advantage (Games 1, 2 and 5 at home), which was determined by playing record. Houston and St. Louis tied for the Central Division title, but Houston was awarded the division winner's playoff-seeding over St. Louis due to their 9–7 advantage in head-to-head play. Officially the two clubs were co-champions. Although the team with the best record was normally intended to play the wild card team, the Astros played the Braves, rather than the wild card Cardinals, because the Astros and Cardinals are in the same division. In Game 1, Greg Maddux faced Wade Miller. Brian Jordan drove in the first two runs of the game, hitting a sac fly in the first and a solo homer in the fourth. But the Astros would strike back against Maddux. Brad Ausmus's two-run homer tied the game in the fifth for the Astros. Then Moisés Alou's groundout in the sixth gave the Astros the lead. But the Braves refused to concede. They struck for four runs in the eighth, an inning capped by Chipper Jones's dramatic three-run homer. Both teams would homer in the ninth but John Smoltz got the save as the Braves won 7–4. In Game 2, Tom Glavine and Dave Mlicki started a classic pitching duel. In the top of the second, B.J. Surhoff doubled to lead off the inning. Then Andruw Jones singled to the shortstop and an error by Julio Lugo put Surhoff on third. Rey Sánchez would then ground into a double play by Surhoff would score to make it 1–0 Braves. In all but two innings the Astros had a hit and they would strand five in the game. Glavine pitched eight innings and Smoltz recorded his second consecutive postseason save. In Game 3, Shane Reynolds faced John Burkett. In the bottom of the second, Paul Bako's two-run homer put the Braves up 2–0. In the third, Julio Franco homered to make it 3–0. Then a squeeze play by Bako in the fourth made it 4–0. Reynolds only lasted four innings and Burkett cruised until giving up a two-run homer to Daryle Ward in the sixth. Chipper Jones's two-run homer provided insurance in the bottom of the eighth and Smoltz once again dominated the ninth. Ausmus flied to center to end the series. Once again, the Astros had been denied by the Braves for their first ever postseason series win. This, to date, is the last postseason series win by the Braves. Game 1 was a game of excellent starting pitching. Matt Morris faced Curt Schilling, who made the most of his first playoff start in eight years. Both pitchers were on even terms until the bottom of the fifth when Arizona struck first when Steve Finley singled home Damian Miller. The game remained 1–0 as Schilling managed to pitch a complete-game three-hit shutout. In Game 2, Woody Williams faced Randy Johnson. Johnson seemingly had the Cardinals in the first when he got Plácido Polanco to ground into a double play. But Edgar Rentería walked and up came the soon-to-be-named NL Rookie of the Year Albert Pujols. He then hit his first playoff home run to make it 2–0 Cardinals in the top of the first. Then Polanco's sac fly made it 3–0 in the third. The D'Backs would scratch out a run in the eighth, but an error by Miguel Batista gave the Cardinals a commanding 4–1 lead in the ninth. Steve Kline got the save in the bottom of the ninth to even the series. In Game 3, Batista returned to the mound to start. Opposing him would be Darryl Kile. Both pitchers worked their way through each inning and kept it scoreless into the fourth. But Jim Edmonds's two-run homer in the bottom of the fourth gave the Cardinals the lead. Luis Gonzalez responded with a homer off the right field pole to make it a one-run game in the sixth. Then the Diamondbacks came back in dramatic fashion. After Kile allowed a leadoff walk in the top of the seventh, Mike Matthews came on in relief. Greg Colbrunn tied the game with an RBI single with one out. A fielder's choice put two men on for eventual NLCS MVP Craig Counsell. He then hit a three-run home run to right that put the D'Backs ahead by three. However, Rentería would homer to make it a two-run game. But Byung-Hyun Kim closed the door in the ninth. Tragically, this wound up being Kile's final playoff game. Albie Lopez looked to close the door on the Cards. Opposing him would be Bud Smith. Smith got into trouble in the top of the first when Steve Finley singled home a run to make it 1–0 Diamondbacks. But J. D. Drew's RBI single tied the game in the bottom half of the inning. Then Jim Edmonds hit the go-ahead home run in the bottom of the second to put the Cardinals up for good. Then Fernando Viña's two-run homer in the third gave the Cardinals insurance. Both bullpens held the other team to nothing for the rest of the game as the series was once again tied. In the clinching Game 5, Matt Morris once again faced Curt Schilling. Both pitchers were on their game, allowing only one run throughout the entire game. Morris was the first to falter in the bottom of the fourth when he gave up a solo home run to Reggie Sanders. Schilling was masterful and was four outs away from winning the series. He was working on a 1–0 four-hit shutout when J. D. Drew tied the game with a solo homer of his own in the eighth. Schilling pitched a complete game and the D'Backs now had to get him the win. A leadoff double by Matt Williams gave the D'Backs a good chance. A sac bunt by Damian Miller put pinch runner Midre Cummings on third. After Colbrunn was walked intentionally, Cummings tried to steal home on the squeeze play attempt and got caught. Colbrunn went to second and Danny Bautista came on to pinch run. Then Tony Womack delivered the series winning single to left field. The Diamondbacks won their first postseason series ever and were now going to their first ever NLCS. For the first and only time, Fox Family and Fox carried the National League Division Series with Kenny Albert and Rod Allen calling the action of Game 1 and Game 2 of the Atlanta-Houston series for Fox Family, while Mel Proctor and Rod Allen calling the action of Game 3 of the Atlanta-Houston series for Fox, Fox Family and Fox carried the National League Division Series with Thom Brennaman (himself a Diamondbacks broadcaster) and Steve Lyons calling the action of Game 1 and Game 2 of the Arizona-St. Louis series for Fox Family, while Joe Buck and Tim McCarver calling the action of Game 3, Game 4 and Game 5 of the Arizona-St. Louis series for Fox Family (Games 3–4), and Fox (Game 5). ESPN Radio provided national radio coverage for the fourth consecutive year, with Wayne Hagin and Buck Showalter calling the action of the Atlanta-Houston series, while Charley Steiner and Dave Campbell calling the action of the Arizona-St. Louis series. Locally, the Arizona-St. Louis portion of the 2001 NLDS was called on KTAR-AM in Phoenix by Greg Schulte, Jeff Munn, Rod Allen (Games 4–5) and Jim Traber, and on KMOX-AM in St. Louis by Jack Buck (Games 3–4), Mike Shannon and Dan McLaughlin (Games 1–2, 5), while the Atlanta-Houston portion of the 2001 NLDS was called on WSB-AM in Atlanta by Pete Van Wieren, Skip Caray, Don Sutton and Joe Simpson, and on KTRH-AM in Houston by Milo Hamilton and Alan Ashby. 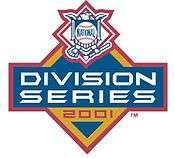 ↑ "2001 NLDS - Atlanta Braves vs. Houston Astros - Game 1". Retrosheet. Retrieved September 13, 2009. ↑ "2001 NLDS - Atlanta Braves vs. Houston Astros - Game 2". Retrosheet. Retrieved September 13, 2009. ↑ "2001 NLDS - Houston Astros vs. Atlanta Braves - Game 3". Retrosheet. Retrieved September 13, 2009. ↑ "2001 NLDS - St. Louis Cardinals vs. Arizona Diamondbacks - Game 1". Retrosheet. Retrieved September 13, 2009. ↑ "2001 NLDS - St. Louis Cardinals vs. Arizona Diamondbacks - Game 2". Retrosheet. Retrieved September 13, 2009. ↑ "2001 NLDS - Arizona Diamondbacks vs. St. Louis Cardinals - Game 3". Retrosheet. Retrieved September 13, 2009. ↑ "2001 NLDS - Arizona Diamondbacks vs. St. Louis Cardinals - Game 4". Retrosheet. Retrieved September 13, 2009. ↑ "2001 NLDS - St. Louis Cardinals vs. Arizona Diamondbacks - Game 5". Retrosheet. Retrieved September 13, 2009.